The Spectrum Resorts Front Desk is located at The Village at the entrance of the resort. On-site Check-in: We’re on-site to take care of you. Grocery Delivery: We’ll take care of the groceries so you can get to the beach quicker. Special Occasions:Anniversary, Birthday? We’re here to help! 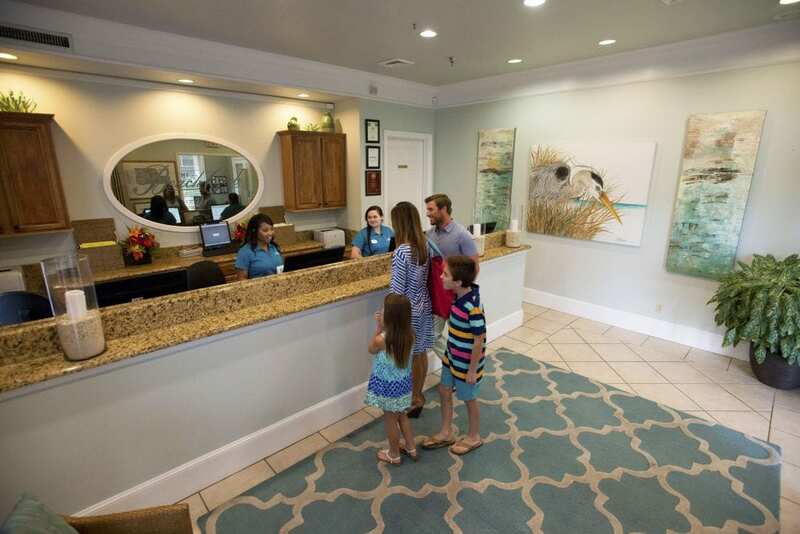 The front desk is the hub of resort operations, and from the moment you arrive here your worries are whisked away. Our GEMs are available to assist with any concerns that may arise during your stay as well as offer concierge services. Your relaxation starts here. The GEM Program is unique to Spectrum Resorts Rental program. GEM stands for Guest Experience Management. Here, GEMs do everything to make your stay as enjoyable and unique as possible. From special requests to providing tickets and activities to local attractions for our repeat guests, our dedicated staff members ensure you experience the highest level of service before, during and after your stay with Spectrum Resorts. A GEM will contact you prior to arrival to see if they can help answer any questions you may have about your upcoming stay. They also play the role of personal concierge helping guests with such requests as making dinner reservations, tee times, spa appointments or even stocking your room with groceries. Their goal is to make your vacation hassle-free and relaxing.